I passed through the Seattle area a few times long before I ever settled in the region to prepare my nautical escape pod… this trip had me speaking at the Seattle Bicycle Expo, Microsoft, Fluke, Sharp, and Hewlett-Packard all in the same week. (Here is a roster of public appearances during those crazy years.) I still carry the excellent Fluke 87 digital multimeter that was donated during the company visit captured in this photograph. This much-loved writer at the Herald, Jim Haley, was celebrated with a delightful farewell video when he retired in 2008. It’s easy to forget sometimes, with all these articles about my bike, that every one of them was written by a fellow journalist… and the reason my own quirky career got so much positive media coverage is that I was simply doing something that every writer dreams of doing: making a living with my craft while traveling freely and having the adventure of a lifetime. Steve Roberts has many passions, and he’s not shy about pursuing each and every one of them, all at the same time. That’s difficult when bicycles, ham radio, computers, travel and writing all are high on his list. But he’s found a way to link all of these and more. Picture a tall, 39-year-old ex-Ohioan under a helmet rivaling a Navy fighter pilot’s. 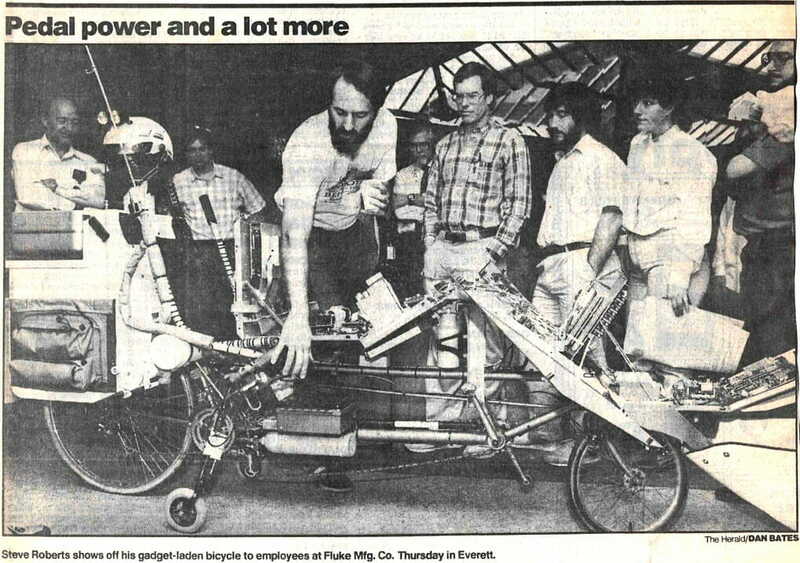 He’s sitting on his 17-foot-long, 105-speed bicycle. There are antennas and gadgets poking out all over. He can roll down the highway at 15 mph, and type on the keyboard built into his low-slung handle bars. Roberts is working on a travel book as well as his new “sort of a science fiction” novel. If he gets a yen, he can communicate with some of his many pals over a computer or ham network. His cellular telephone (complete with answering machine, fax and computer modem that’s linked to a satellite) is close at hand. Solar panels feed the battery operating the gadgetry. What if it’s a hot day? 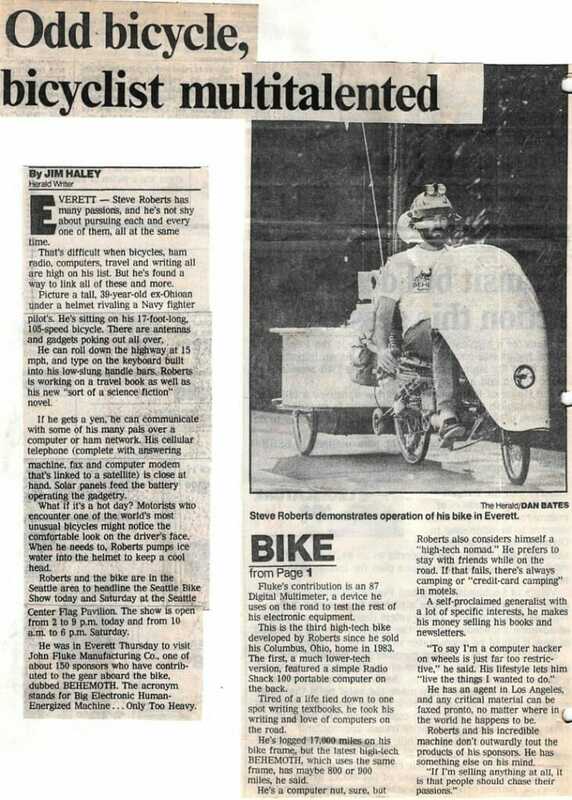 Motorists who encounter one of the world’s most unusual bicycles might notice the comfortable look on the driver’s face. When he needs to, Roberts pumps ice water into the helmet to keep a cool head. Roberts and the bike are in the Seattle area to headline the Seattle Bike Show today and Saturday at the Seattle Center Flag Pavilion. The show is open from 2 to 9 p.m. today and from 10 a.m. to 6 p.m. Saturday. He was in Everett Thursday to visit John Fluke Manufacturing Co., one of about 150 sponsors who have contributed to the gear aboard the bike, dubbed BEHEMOTH. The acronym stands for Big Electronic Human-Energized Machine… Only Too Heavy. Fluke’s contribution is an 87 Digital Multimeter, a device he uses on the road to test the rest of his electronic equipment. This is the third high-tech bike developed by Roberts since he sold his Columbus, Ohio, home in 1983. The first, a much lower-tech version, featured a simple Radio Shack 100 portable computer on the back. Tired of a life tied down to one spot writing textbooks, he took his writing and love of computers on the road. He’s logged 17,000 miles on his bike frame, but the latest high-tech BEHEMOTH, which uses the same frame, has maybe 800 or 900 miles, he said. He’s a computer nut, sure, but Roberts also considers himself a “high-tech nomad.” He prefers to stay with friends while on the road. If that fails, there’s always camping or “credit-card camping” in motels. A self-proclaimed generalist with a lot of specific interests, he makes his money selling his books and newsletters. He has an agent in Los Angeles, and any critical material can be faxed pronto, no matter where in the world he happens to be. Roberts and his incredible machine don’t outwardly tout the products of his sponsors. He has something else on his mind.